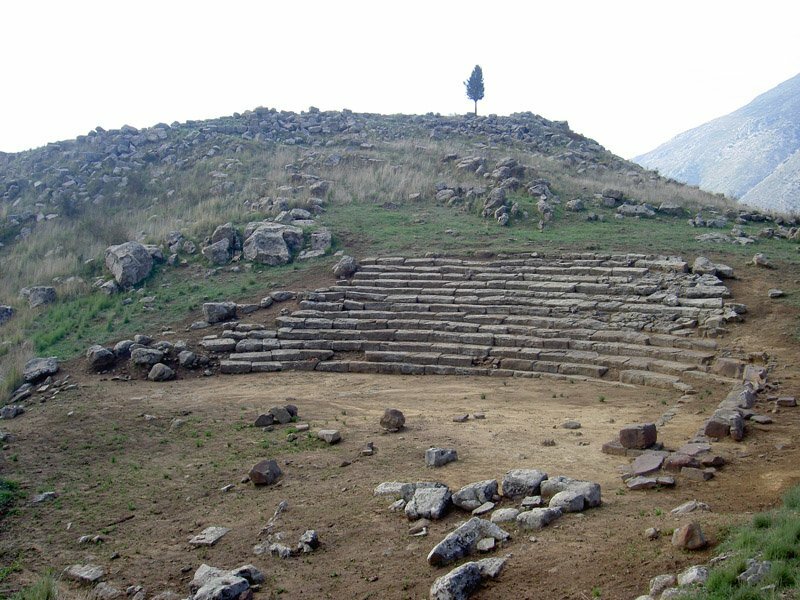 The theatre of ancient Macynia is situated at the “Paliokastro” site of the Municipal Department of Macynia, Nafpaktia Municipality. 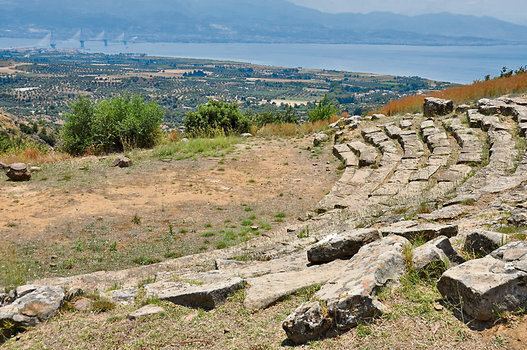 The theatre has a single cuneus and may also have been used as a bouleuterion (council-house). It has an arc-shaped orchestra without a gutter and a narrow cavea without a passageway, with 14 tiers of seats in total. Access staircases in the cavea were not considered necessary for such a small theatre. Officials or guests of honour were seated in the north part of the orchestra. There the arched outline of the cavea is vertically interrupted by three straight, parallel tiers of seats, with an interval of about a metre between the first and second, and transverse slabs serving as seat backs on the third, northernmost tier, showing that these were definitely the seats of honour (proedriae). This meant that the officials could see not only the events on stage but also the audience. In front of the seats of honour is a stone throne intended for the guest of honour. On the east side of the theatre is the stage building, which, however, has collapsed due to the steep incline of the slope on which it was built, while it is also possible that the building material was gradually removed and reused in later structures. A few foundation stones which survive, through not always in their original position, allow a tentative reconstruction of the stage building. Its dimensions are estimated at 21.60 m. x 9.70 m. The foundations of the narrow theatre parodoi are also visible. No parascenia or other elements of the theatre can be seen, except for part of an angled retaining wall along its south side. The friable sandstone of which the theatre is built makes the thorough cleaning and conservation of its seats and other functional parts a matter of urgency. The theatre was excavated in 1988 and 1989 due to illegal excavation activity observed there. The only permitted use is a simple visit. 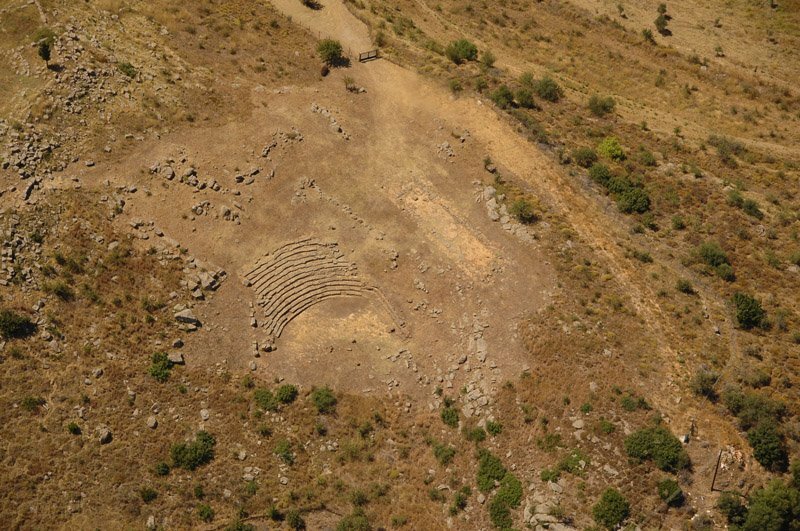 The theatre of ancient Macynia is situated at the “Paliokastro” site of the Municipal Department of Macynia, Antirrio Municipality. 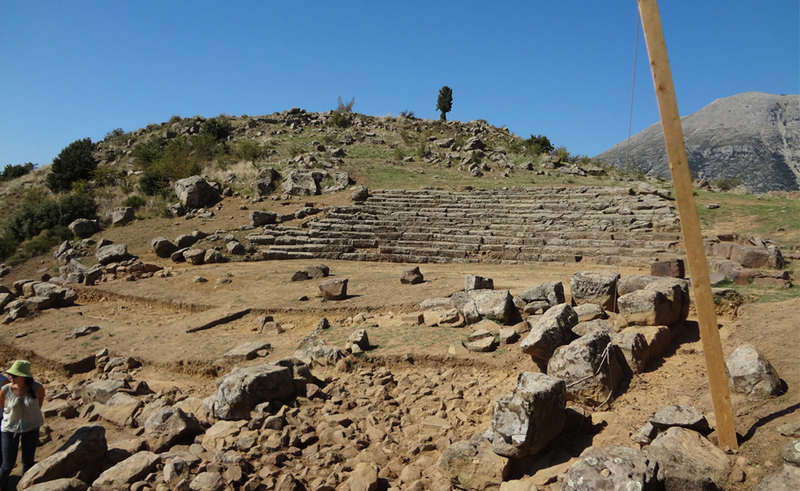 The theatre has a single cuneus and may also have been used as a bouleuterion (council-house). It has an arc-shaped orchestra without a gutter and a narrow cavea without a passageway, with 14 tiers of seats in total. – Λ. Κολώνας, Μακύνεια, ΑΔ 48 (1993), 141-2. – Λ. Κολώνας, Η Μακύνεια μέσα από τις πρόσφατες αρχαιολογικές έρευνες, Ναυπακτιακά, vol. 6, 1992-93, Athens 1994, pp. 79-95. 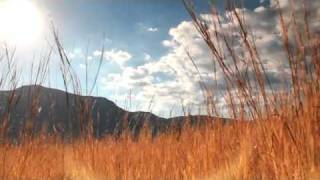 – St. Steiros – P. Psimoulis & Chr. 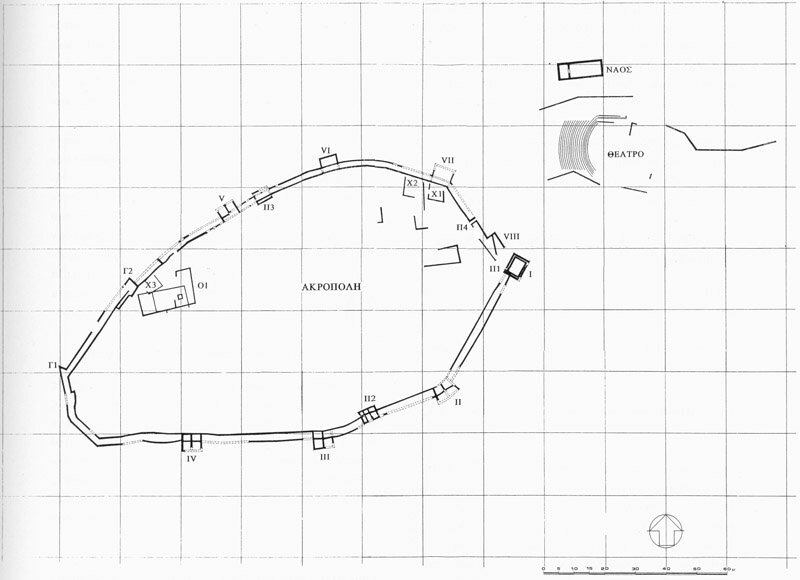 Kolonas, The Theatre of Aitolian Makyneia, BSA 100 (2005). Municipal Department of Macynia, Municipality of Nafpaktia, “Paliokastro” site. 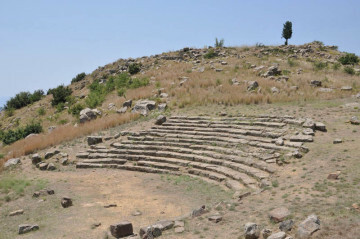 The theatre of ancient Macynia is situated at the “Paliokastro” site of the Municipal Department of Macynia, Antirrio Municipality. 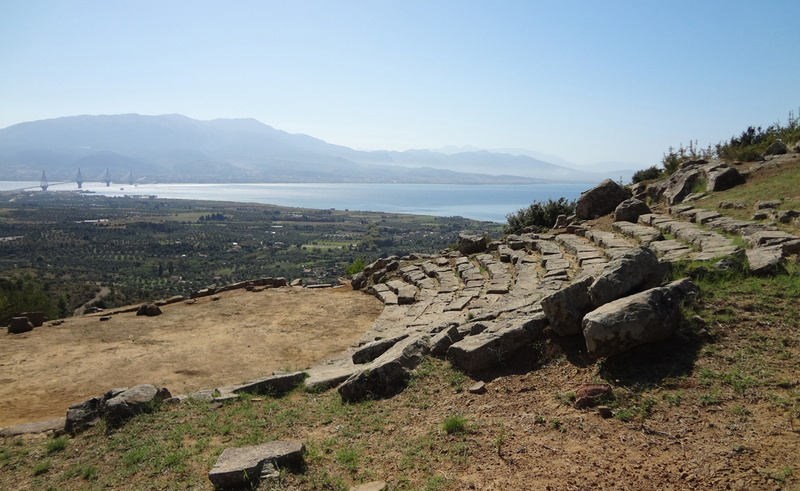 The theatre has a single cuneus and may also have been used as a bouleuterion (council-house). It has an arc-shaped orchestra without a gutter and a narrow cavea without a passageway, with 14 tiers of seats in total. Access staircases in the cavea were not considered necessary for such a small theatre. Officials or guests of honour were seated in the north part of the orchestra. There the arched outline of the cavea is vertically interrupted by three straight, parallel tiers of seats, with an interval of about a metre between the first and second, and transverse slabs serving as seat backs on the third, northernmost tier, showing that these were definitely the seats of honour (proedriae). This meant that the officials could see not only the events on stage but also the audience. In front of the seats of honour is a stone throne intended for the guest of honour. The friable sandstone of which the theatre is built makes the thorough cleaning and conservation of its seats and other functional parts a matter of urgency. The theatre was excavated in 1988 and 1989 due to illegal excavation activity observed there. The monument belongs to the jurisdiction of the Ministry of Culture and the archaeological service responsible for Aetoloacarnania Prefecture (36th Ephorate of Prehistoric and Classical Antiquities of Messolonghi), while the publication rights are held by Lazaros Kolonas, General Director of Antiquities and Cultural Heritage of the Ministry of Culture. 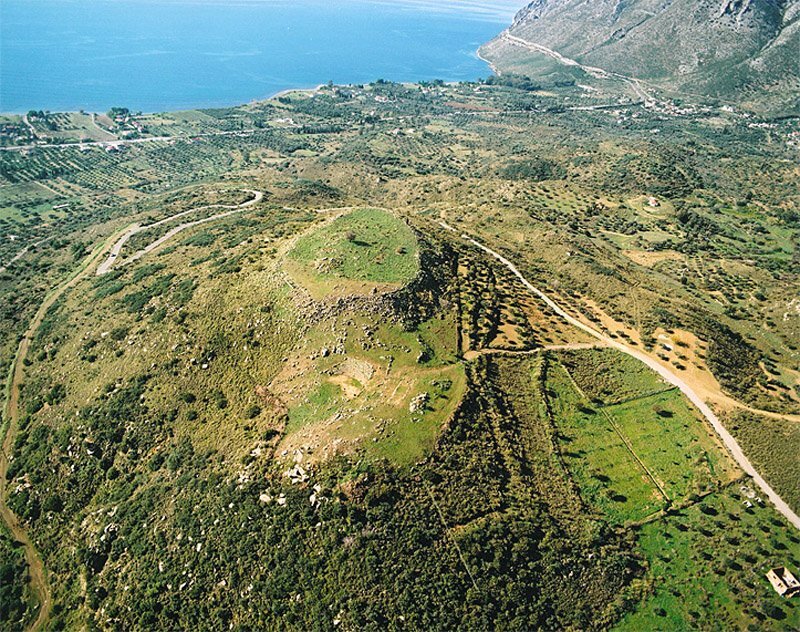 The monument belongs to the jurisdiction of the Ministry of Culture and the archaeological service responsible for Aetoloacarnania Prefecture (36th Ephorate of Prehistoric and Classical Antiquities of Messolonghi). Excavations works are already in progress via the Programmatic Agreement, signed by the former Municipality of Antirio with the Ministry of Culture and Tourism, amounting to 70.000,00 €. Diazoma with collaboration with GEFYRA S.A. will assemble the amount of 50.000,00 €. 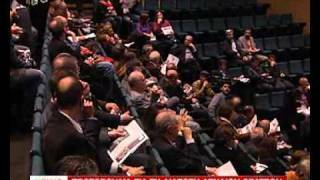 Mobilisation around the project “Cultural and Natural Route of Etoloacarnania”.